This past week we have been having fun gearing up for Halloween. One thing that our family really loves is family game night. So I decided it would be fun to have a Halloween themed game night and play some of our games that would best fit the Halloween theme. 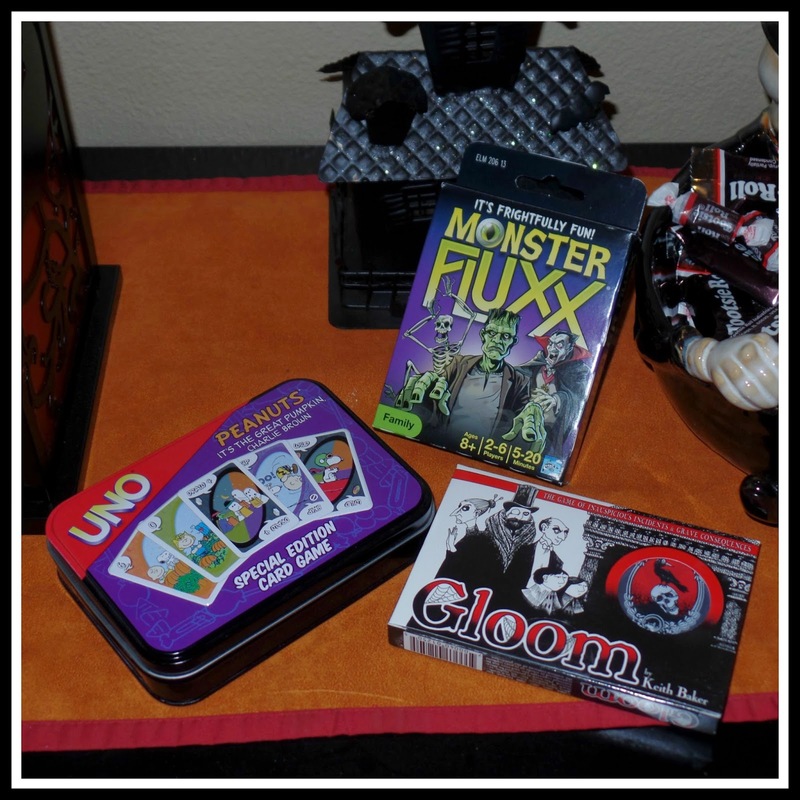 I chose Monster Fluxx, which was really fun, we normally play Star Fluxx which is really fun too so when I saw Monster Fluxx I knew it would be fun for Halloween, we played a couple of rounds of It's Great Pumpkin Charlie Brown themed UNO, we have had this UNO game for years and play it every Halloween. A new game we tried out is called Gloom, this is a fun game that involves a little creative story telling and strategy and features interesting families of gloomy characters, we look forward to playing this one again too! 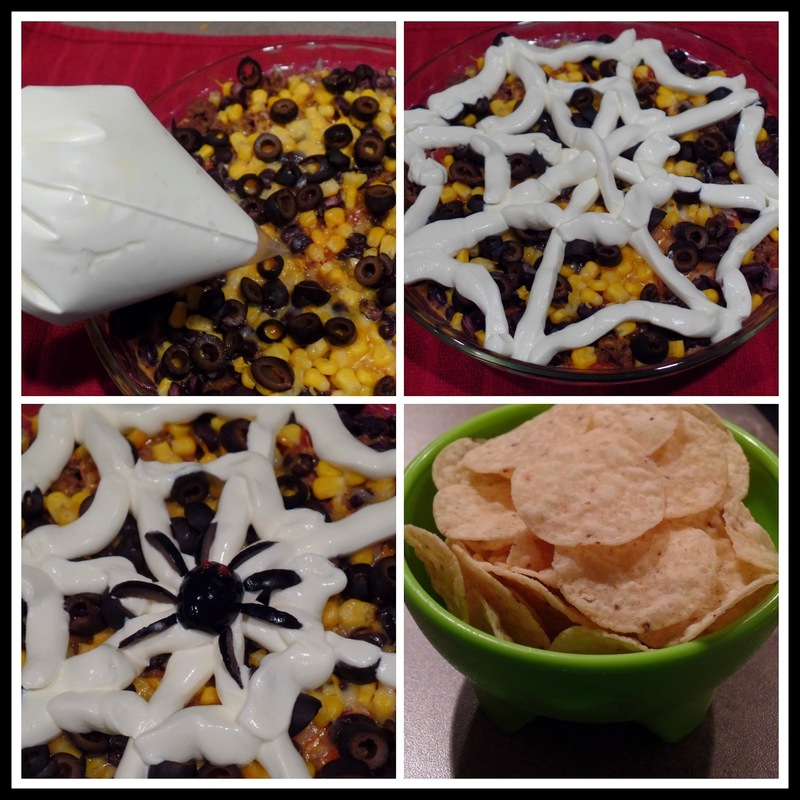 I thought a nice simple dinner of our family favorite layered nachos would be the perfect dinner for game night, and to make it fit our Halloween theme, I topped it with a "spiderweb" sour cream topping and an olive "spider". Here's how I made it. In a round pie dish spread 1 regular size can of refried beans, you can heat it up in advance on the stove top or heat it for a couple of minutes in the microwave after spreading it in the pie dish (of course if it is a microwave safe dish). Then top with a thin layer of shredded Mexican cheese blend, and a thin layer of your favorite salsa, next, add half of a can of drained and rinsed black beans along with half a can of drained and rinsed corn, then add a layer of thoroughly cooked and browned hamburger, about a pound, you can season it with a little dried minced onion and cumin or a teaspoon of your favorite taco seasoning, then add another thin layer of salsa, cheese, the other half a of the can of drained and rinsed black beans and drained corn, top with a bit more cheese then either heat it through in the microwave, which is pretty quick, or heat it in the oven at 350 F. until the cheese is melted and everything is heated through. When the layered nacho dip is heated through, top with sliced black olives if you like them ( I made two batches, one with olives and one without). To make the spiderweb sour cream topping, scoop about a cup of sour cream into a large ziploc bag, down into one corner of the bag, then cut out the corner and it works just like a decorator bag. Pipe on a spiderweb shape to the top of nachos. To make the spider for the center of the web, I cut a large black olive in half, one half makes the body, the second half I cut into eight thin slices and place around the body as legs. Using a toothpick I added two red eyes to the spider out of ketchup. To serve, scoop a pile of layered nacho dip onto a plate and serve with tortilla chips, I love the little round chips because they are sturdy enough to hold the dip. 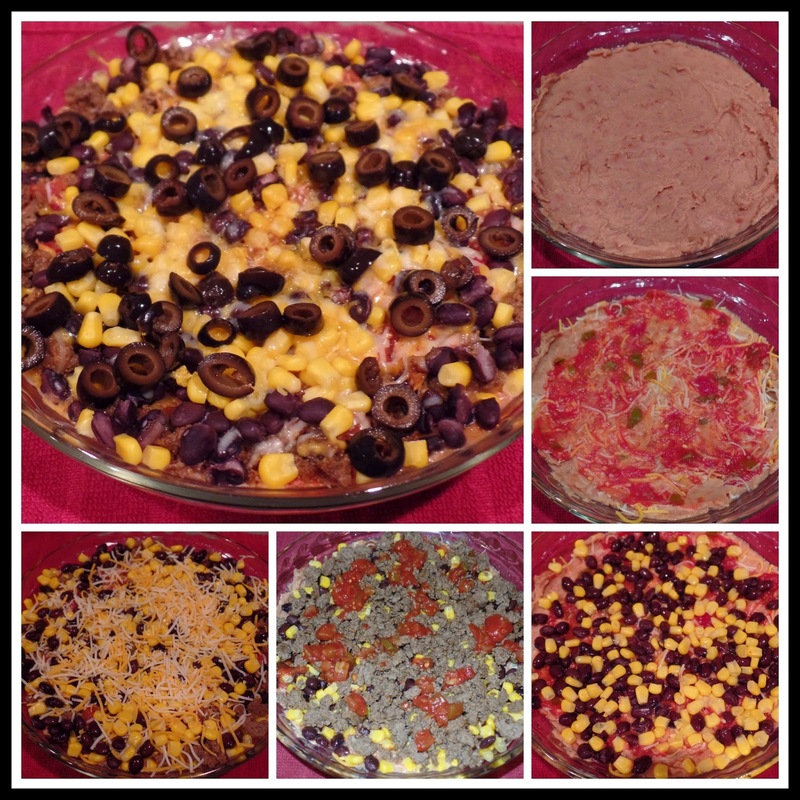 I have made this recipe before you can read my original recipe for layered nachos here. We have also been busy lately carving pumpkins. 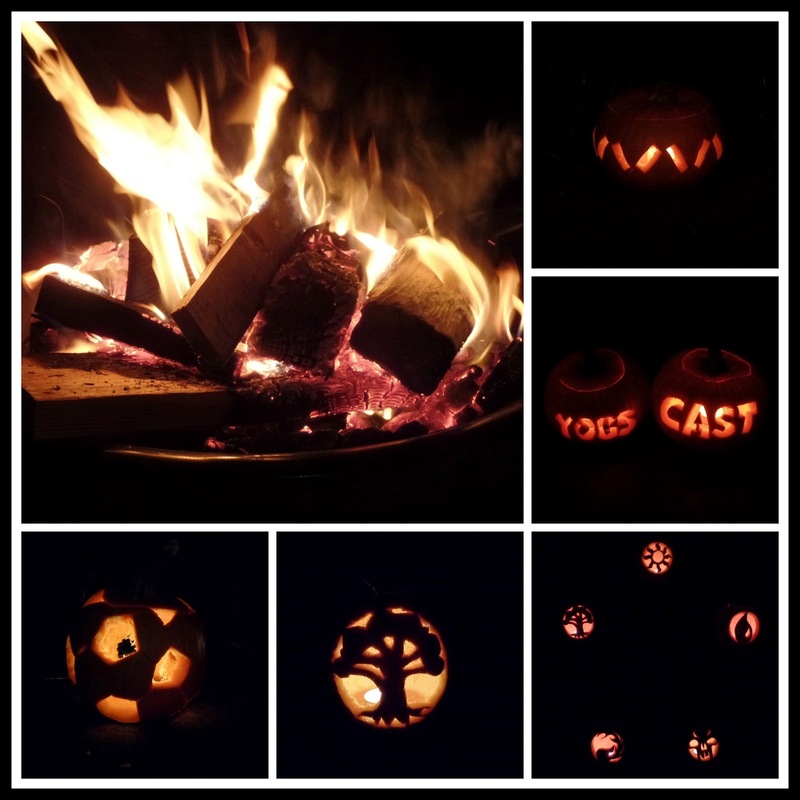 I am allergic to raw pumpkin so I can't carve them myself, luckily hubby carved in my design for me, the kids had fun carving their pumpkins into themes that they are interested in, we lit a fire in the fire pit as well, and carved after dark since it gets dark so soon these days. The weather held out and it was a very nice evening. Then a couple of nights ago I saw a local news story about The Teal Pumpkin Project. 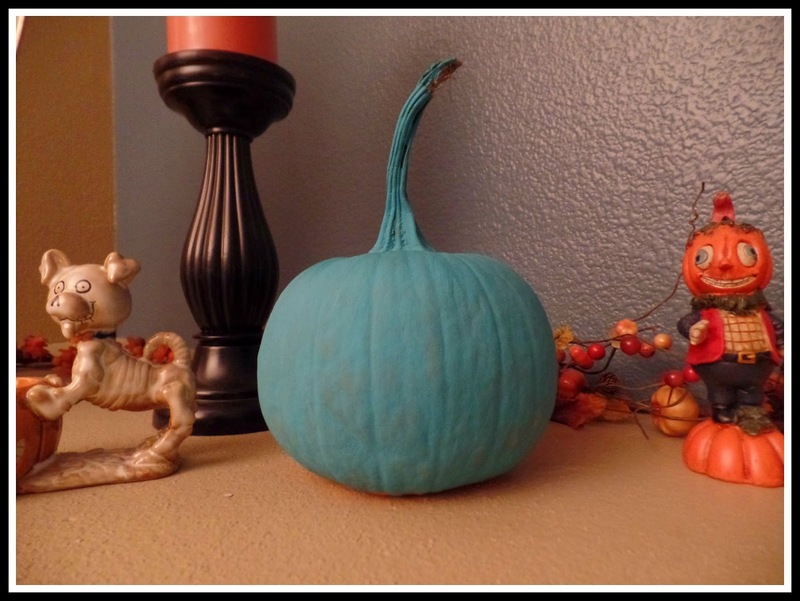 The idea is to paint a pumpkin teal and set it outside your front door to let children with allergies know that you have non candy treats available that are kept in a bowl separate from any candy that might contain allergens. Since I too have tree nut and shellfish allergies as well as allergies to a host of other random things, I can definitely understand what a struggle this might be for kids with life threatening allergies. Allergic reactions are scary, my allergies didn't surface until I was an adult, it is difficult now as an adult to constantly check things, I can't imagine how hard it is for parents of children with very serious allergies. So when I saw this I knew I had to take part and raise awareness by setting out a teal pumpkin and posting a sign. Click the link below for print outs, information, and ideas for non candy treats. Wonderful creations, and the recipe looks so cool! Happy Halloween! OMG! I love the YOGS Cast pumpkin. I have a Minecraft kid in my house. We have sat through many hours of Simon and Lewis!! Too fun! thanks for joining Home Sweet Home!